I was invited to a “coffee” event with State Senator Gil Cedillo, as many (but not all) elected officials are apt to do in order to be more in touch with their constituents. It took place at Sabor y Cultura Coffeehouse in Hollywood. Thing is, Cedillo is not my State Senator (Curren Price is), but he’s currently running for the 45th State Assembly District seat held my my Assemblyman, Kevin De Leon, who is running for Cedillo’s seat. Wait, what? Being that he recently won the Democratic nomination for the seat in this past Tuesday’s primary election, and that his district is overwhelmingly Democrat, it’s a pretty safe bet that he’ll get the seat, so he’s reaching out to his inevitable constituents. Cedillo’s communications deputy, Conrado Terrazas, an old friend of mine (I campaigned for him in his attempted bid to run for 13th District City Council back in 2001), informed me about the event, and so I decided to check it out. About two dozen community stakeholders in attendance, a quarter of whom were familiar faces. I did get one question in in the Q-and-A with Cedillo, asking him how he can streamline the bureaucratic hoops one must face in getting Caltrans to cooperate with regard to getting freeway easement property cleaned up. Oftentimes, the City will have the resources to clean up trash, graffiti and other blight, but once we hit freeway (state) property, that becomes Caltrans’ jurisdiction and services become interrupted due to that. He did say he would get the various jurisdictions to change their way of thinking and cooperate. I also asked if he would be open to allowing arts and environmental organizations beautify such spaces, of which he pledged his support. Sounds good, as the next community project I’m tackling will include an experimental plan to beautify a blighted street, part of which includes a freeway easement. After discovering during a Bicycle Kitchen visit on Monday that my trusty nearly-4-year-old Schwinn mountain-bike-with-road-tires had a rear frame crack that contributed to the incessant creaking sound for the past several months, I made an appointment at The Kitchen for today to refurbish my old Motobecane road bike, which had been sitting unused in my porch, collecting dust, cobwebs and the odd plant vine. I bought the bike in 1993 from an ad in the Recycler. The seller was someone in Santa Monica who sold it for $60, with a car bike rack. The rack didn’t fit my car, so I sold it for $20, which made this a $40 bike. It was my main two-wheeler for many a summer when the only place I would really ride a bike was along the Santa Monica Bay beach bike path between Will Rogers and Redondo beaches. The last time I rode it was in 2006. I spent about five greasy, muscle strained, and occasionally profanity-filled, hours on Saturday afternoon installing new tires, inner tubes and front brakes, and cleaning out slightly rusty components with steel wool. The thing rides pretty nice, though I really want to change the unsightly, heavily rusted wheels. But hey, it’s a built-in theft deterrent, I guess. Yesterday, the Los Angeles City Department of Transportation laid the paint on the first-ever shared-use arrows (a.k.a. “Sharrows”) in Los Angeles, and they put them right here in East Hollywood! They were installed Friday on Fountain Avenue between Western and Vermont after an implementation process that was some six years in the making. 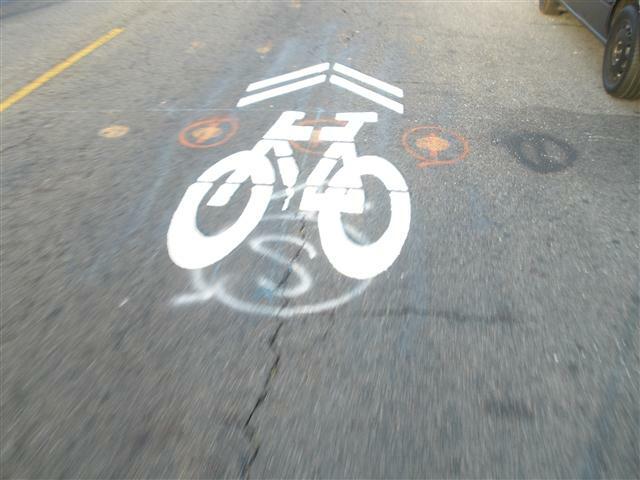 These markings, are meant to guide cyclists and alert motorists to be more mindful of them as they share the lane of travel on the street. These are put in streets where exclusive bicycle lanes are difficult to implement due to space and other constraints. I’ve biked on sharrow’ed streets in places like Portland, Vancouver and, more locally, in Pasadena. So now that I got my wheels, I decided to try them out. They are only painted on the eastbound lane at the moment, although the westbound lane will get the markers perhaps next week. I must say that I’m used to riding towards the curb than the sharrows suggest. I’d have to get a little more used to riding a little towards the center of the road. A definite paradigm shift for not only motorists, but cyclists as well. But a welcome addition nonetheless.